How the Ateneo Lady Eagles must wish that today was Groundhog Day, so that the finals match that they ultimately failed to win would simply rewind itself and start all over again. But today was not Groundhog Day; and at the end of three humbling sets, the Lady Eagles had to face up to the irrevocable fact that there would be no tomorrow. That was because their nemesis and great rivals, the Lady Spikers of De La Salle University, claimed the day and the championship for the third year running. The final score in a jam-packed MOA Arena was 25-23, 25-20 and 25-16. The volleyball, perhaps, never rose to the heights that it did in the second round encounter between the rivals at the same venue last month. In that game, DLSU played with the poise and swagger of a true champion, like royalty haughtily disposing of the challenge posed by a pretender to the throne. Today, while the Lady Spikers were never really in the zone except, perhaps, in the third set when the Lady Eagles were playing something akin to euthanasia volleyball, they were still no-nonsense, efficient and like a lioness in pursuit of a wounded gazelle. As tears flowed for opposing reasons at the end of the UAAP women’s volleyball season, one gets the feeling that this match was also a parting of ways for two teams that contested the finals for two consecutive years. Although unable to match Ateneo for raw power, DLSU’s volleyball was intelligent, dogged and precise. While the likes of Valdez and Gervacio caught the eye with bullet-like smashes, La Salle countered with you-shall-not-pass blocking and balls dropped into holes on the court that Ateneo could not plug. Crucially, the Lady Spikers claimed the first set so much more comfortably than the score of 25-23 seemed to indicate. In fact, they were racing to abbreviate the set but seemed to momentarily take the foot off the pedal before emphatically putting an end to the farce of an Ateneo rally. Up one game in the best-of-three series and one set in the match, the Lady Spikers seemed to go into cruise mode, even allowing the Lady Eagles to race ahead in the early stages of the next two sets. These were the sets when Ateneo showed the crowd as well as the national television audience exactly why they were in the finals. Ateneo did not get there by just being pretty. But even when the Lady Eagles built four-point leads, the Lady Spikers were like a bad cough that just would not go away whatever concoctions the alchemist ordered. The latter just kept coming back, patiently chipping away at Ateneo’s lead until they surged ahead almost as a matter of destiny. When they did, especially past the second technical timeout, the Lady Spikers just had too much savvy to let the lead slip away. In contrast, Ateneo had the skill and power; and when in the zone, the Lady Eagles were a sight to behold. But they could not match the Lady Spikers in belief. Even when the Lady Eagles were playing their best volleyball of the match, all it took was a run of points by La Salle to paste the looks of fear back onto their faces. At times, particularly in the third set, the Lady Eagles played as though they no longer wanted to prolong the inevitable. Arguably, the Lady Eagles lost the finals series in that ultimately mystifying third set last Saturday when, after a dominant performance, they allowed their rivals the Lady Spikers of DLSU to gain an unlikely foothold on the match. In the hands of a powerful army, history tells us, a foothold can be the first brick with which an entire empire is built. In this titanic clash between two collegiate volleyball teams, that foothold turned the tide in favour of the defending champions and was the platform upon which conquest was subsequently completed. As tears flowed for opposing reasons at the end of the UAAP women’s volleyball season, one got the feeling that this match was also a parting of ways for two teams that contested the finals for two consecutive years. On the one hand, the core of Ateneo’s finals team will be graduating; and whether the team will remain as powerful next season is still something that remains to be seen. 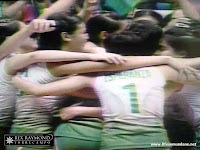 The Lady Spikers, on the other hand, have won the last two championships with a relatively young crew. Young enough, one is tempted to think, to build a volleyball empire.